With just a few clicks to the robot you need. 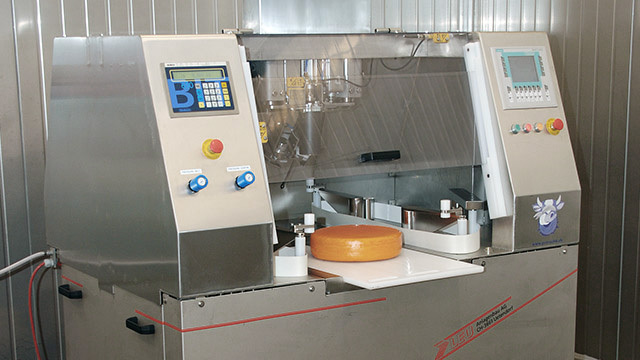 The cheese cutting machine is used to divide cheese loafs or to cut cheese in individual weight-accurate portions. 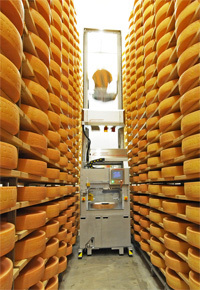 Cutting can be carried out according to a certain size (angle) or weight. A loaf can also be divided into pieces of different weight. 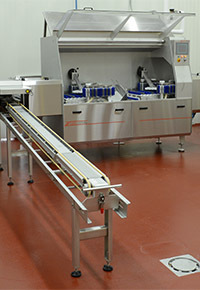 Cutting can be done with a wire or a knife to meet customer’s wishes. 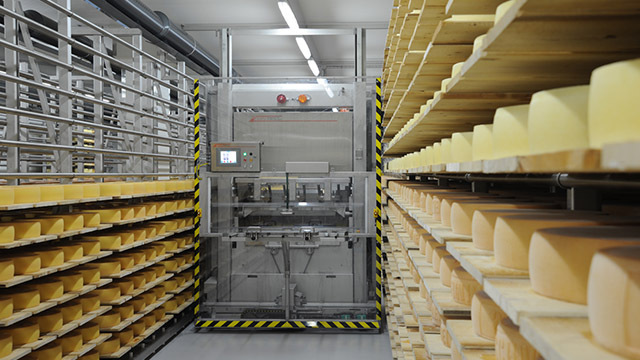 The cheese plasticizing unit is used to apply Foodplast automatically onto semi-hard and hard cheese placed in a cabin by means of special dies for contact-free spraying of a thin layer of Foodplast. 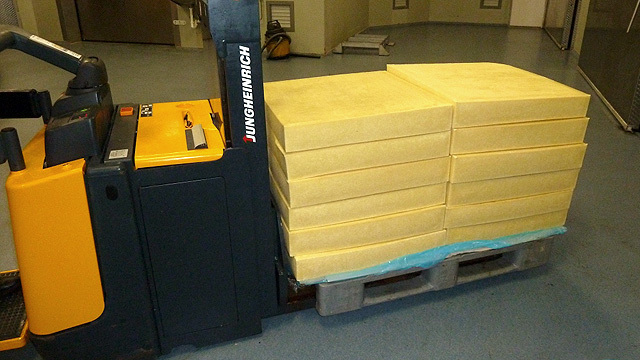 This thickness of protection layer can be set individually. Special dies produce mist with only few material losses. 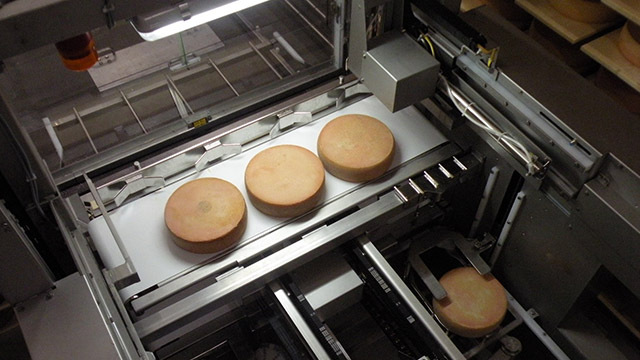 While the machine sprays the loaf, the previous sprayed loaf can be removed to be optionally tagged. 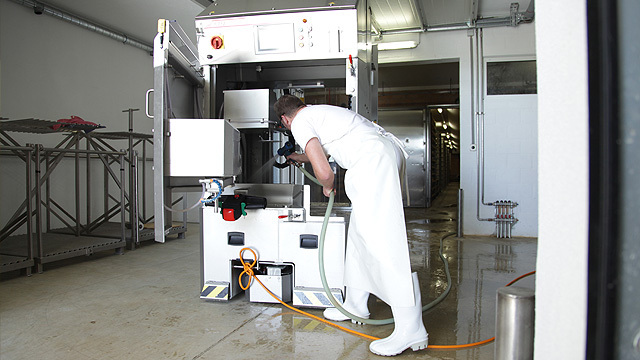 The LBW-35-B is a robust and mobile machine used for thorough washing of cheese boards. 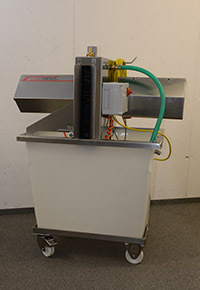 The high-pressure unit provides for a first rough cleaning. 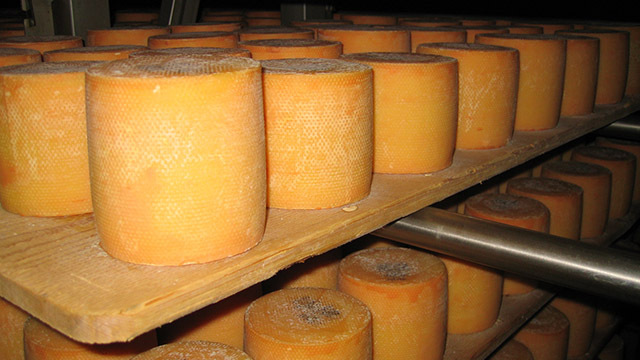 All board faces are then brushed and washed with water before being rinsed with fresh water. Detergents or disinfectants can be added as an option. 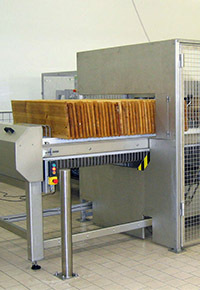 The board feeding is automatic, whereby board washing can be carried out with a single operator. An option is available for re-feeding the boards. 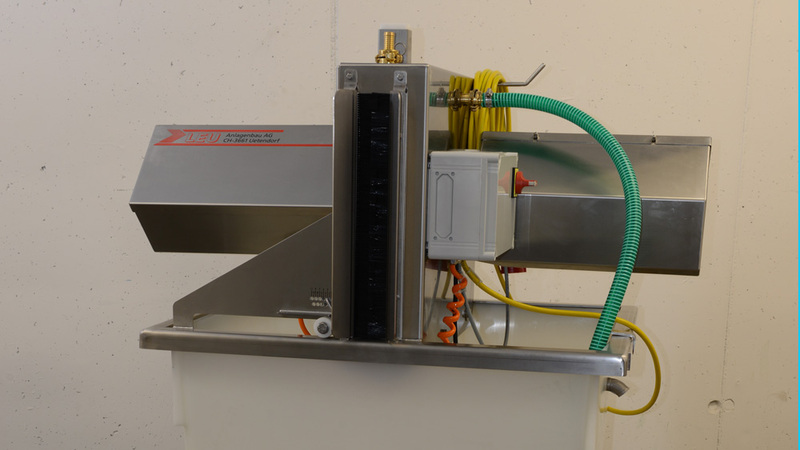 The simple space-saving mobile machine is used to quickly wash cheese boards. 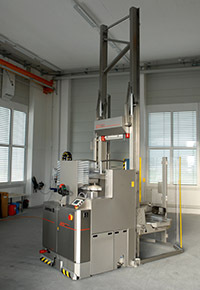 The machine can be operated by one or two persons. 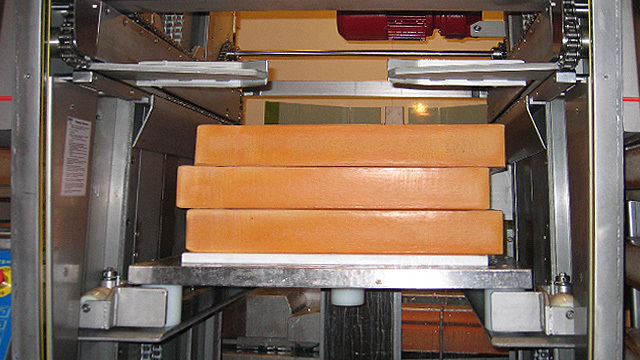 Soiled boards are introduced from the side into the machine. 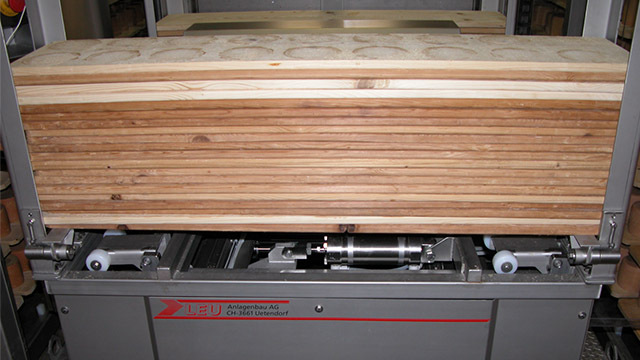 The upper and lower faces of the boards are cleaned in a single operation by rotating brushes. The more heavily soiled front face is brushed with a rotating brush, the opposite face with a fixed brush. 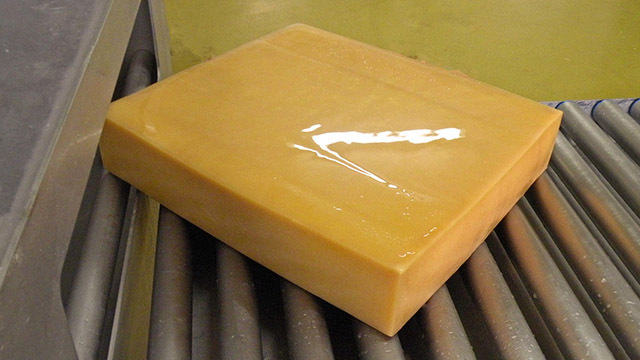 After brushing, the board is rinsed with water which is then recycled. 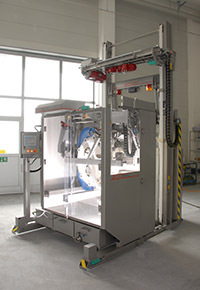 The board washing machine consists of three modules: a soaking bath, a two-stage washing process and a draining channel. 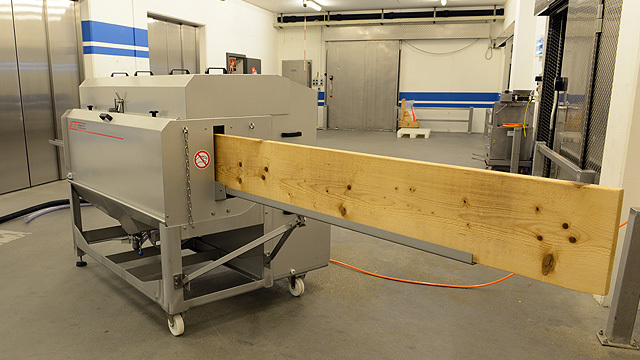 The operator places up to 50 boards onto the soaking bath conveyor. 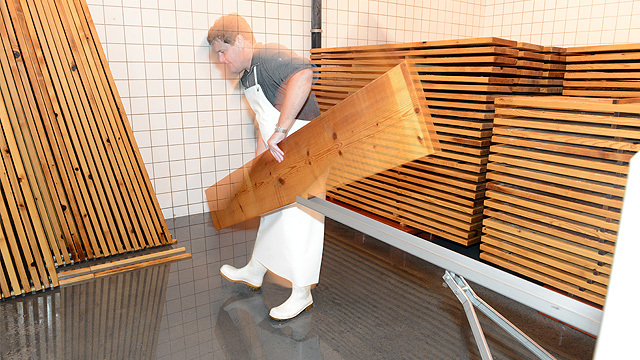 These boards remain for a defined period in the water to soften the cheese smear. 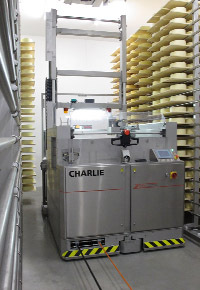 Then the boards are automatically conveyed into the washing machine. 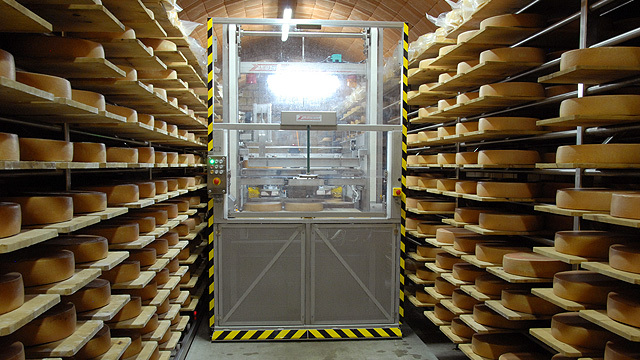 All board faces get a thorough brushing and rinsing with water. The type and hardness of the brushes can be adapted to the job. 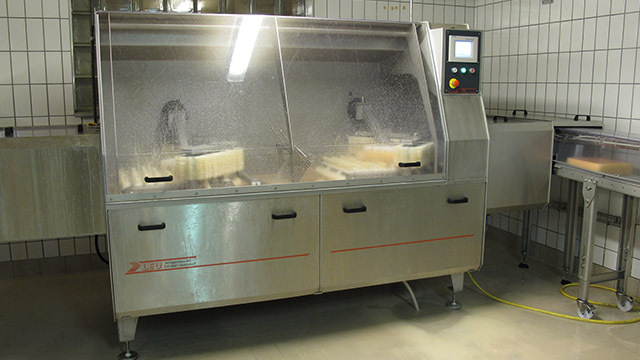 The water used in the second stage will be used again in the first stage of the washing process of the following board and for soaking. 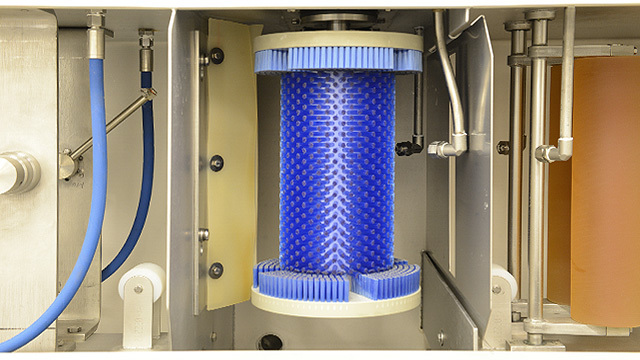 Detergent can be added optionally. 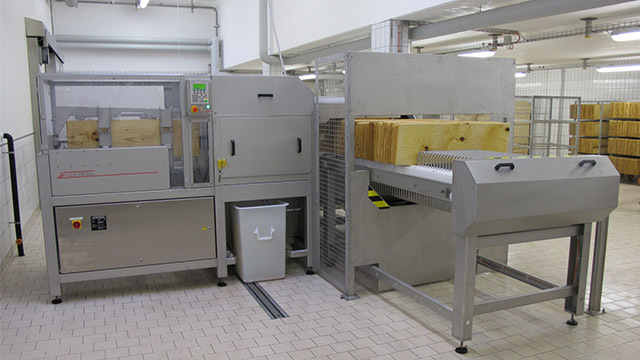 The cleaned boards are automatically conveyed to the draining channel until withdrawal. 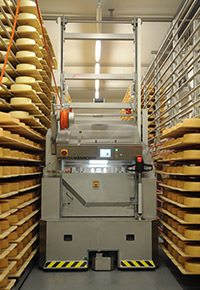 The operator can feed the unit and withdraw boards in regular intervals. 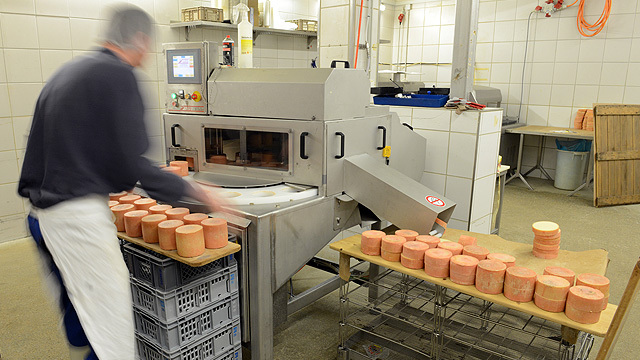 This washing unit carefully removes the cheese smear from the loafs before delivery. 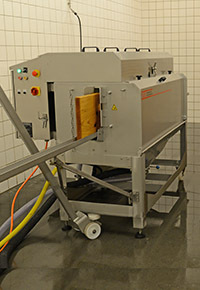 The loafs go through two washing stations where they are brushed on both sides under running water. At the end of this process the loafs are rinsed with fresh water. This rinsing water will be used again to wash the following loaf. 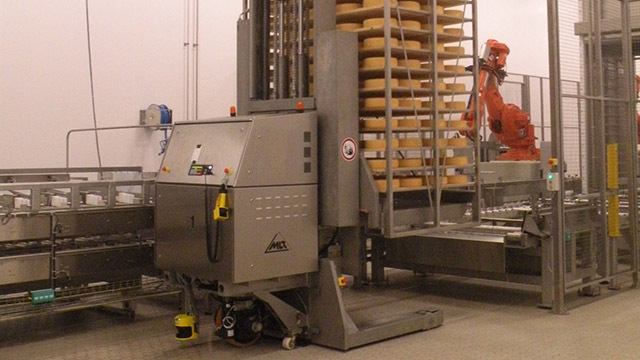 The operator’s work is limited to feeding the loafs into and removing them from the robot after washing. 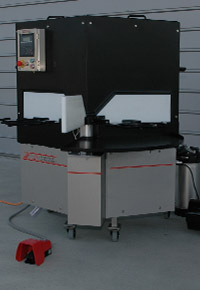 However, it is also possible to automatise this task. 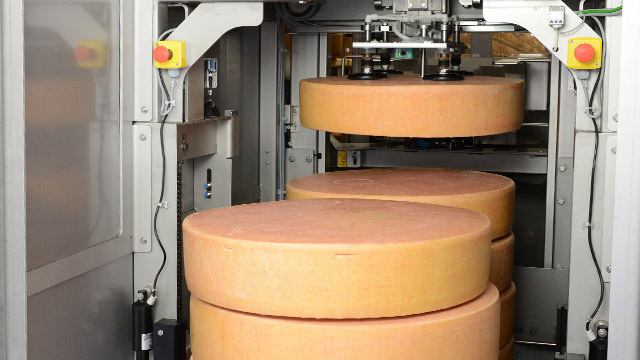 The machine can handle round and square cheese loafs without modification. 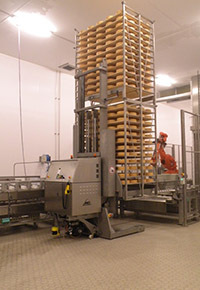 Handling robot for automatic traying in/out of single cheese loafs placed on boards. 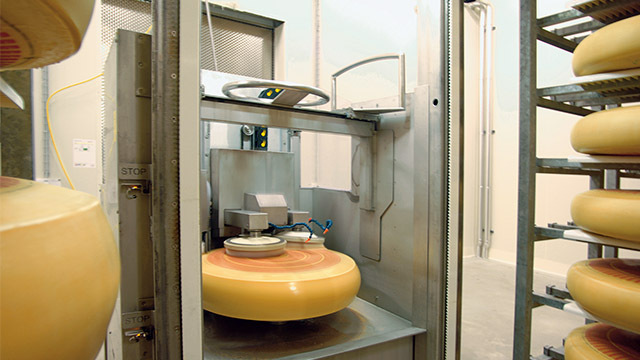 The work of the operator is reduced to the feeding of the robot. 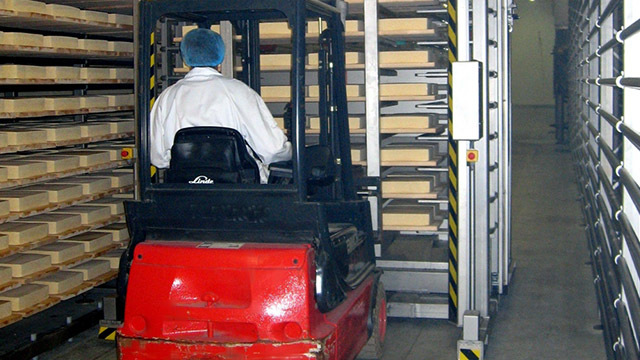 A transport rack with several boards is moved to the robot using a fork-lift truck. 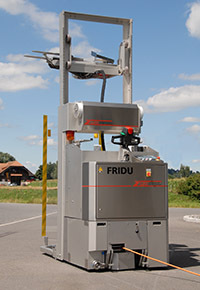 Then the robot takes the boards over and the empty transport rack is taken away by the fork-list truck. 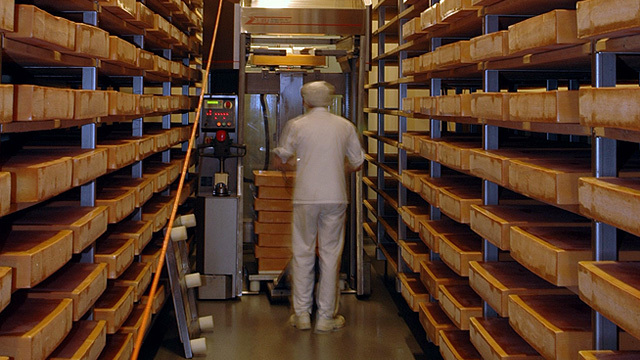 Subsequently the boards are placed into the shelf: Cheese loafs can be trayed in/out on the left, on the right or on both sides of the aisles. 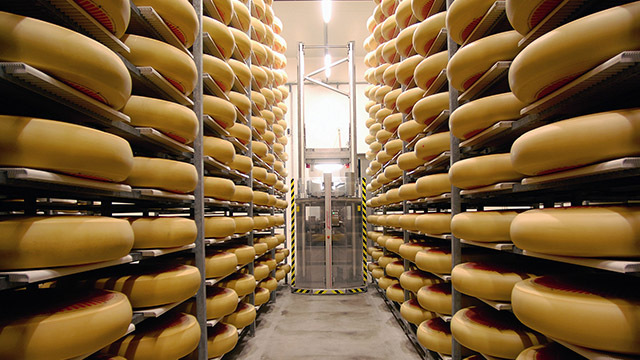 In the meantime, the operator prepares the next transport rack with its cheese loafs. 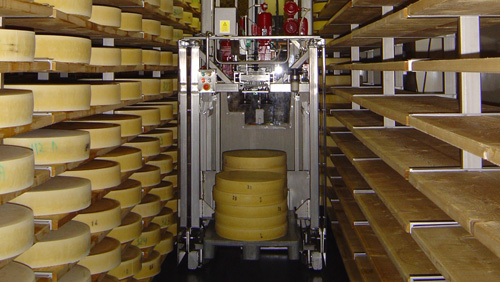 Handling robot for automatic traying in/out of single cheese loafs. 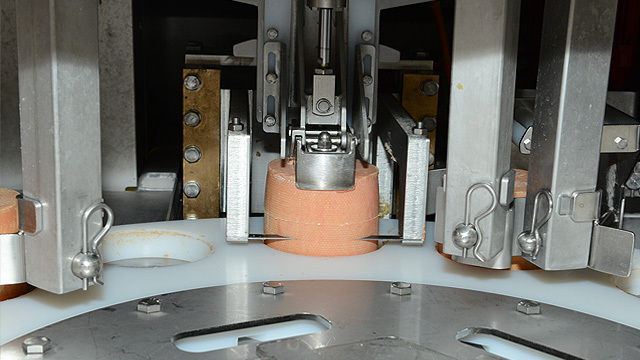 The work of the operator is reduced to the feeding of the robot. 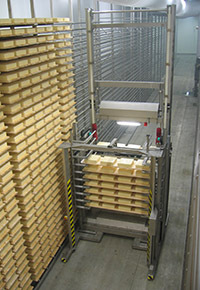 Cheese loafs are transferred from Euro pallets or mobile trays to the robot to be then carefully trayed in by the gripper. 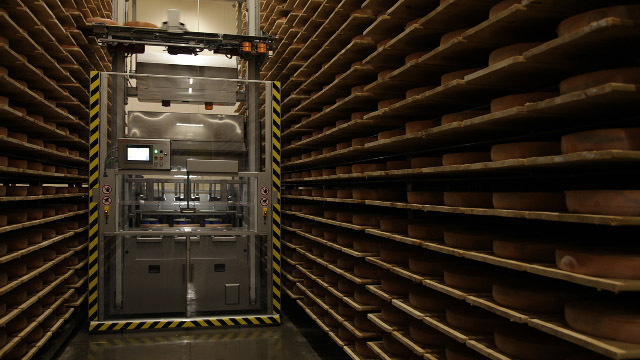 The loafs can be trayed out in reverse order, turned or moved to an empty shelf place on the opposite side of the aisle. 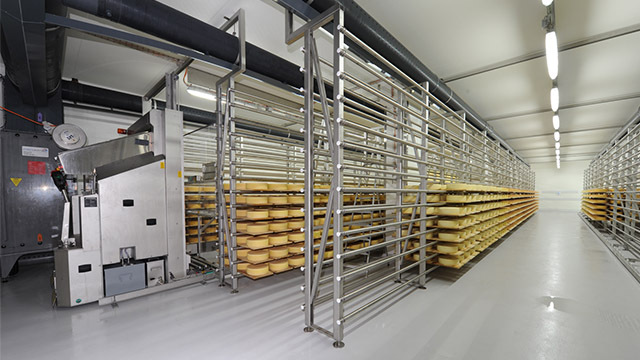 A stationary cheese curing installation has to be developed according to customer requirements to fit exactly into his work process. 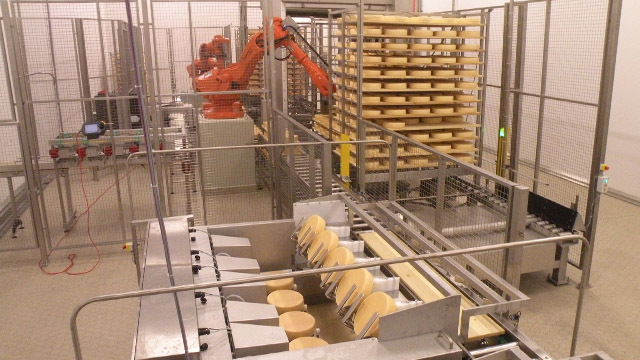 Driverless conveying systems (FTS) and industrial robots ensure a smooth and synchronised operation. 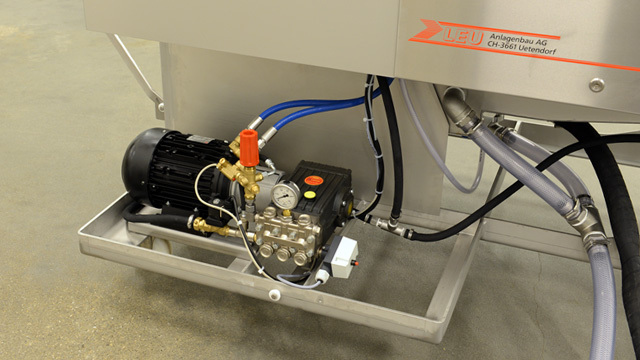 Various components can be integrated in the well-known and proven installation. The control of the installation can be managed by a master computer. 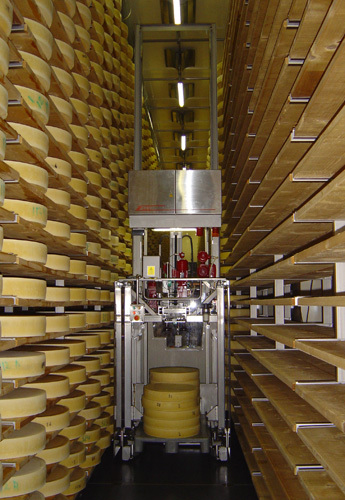 Robot for curing Tête de Moine and Mutschli. 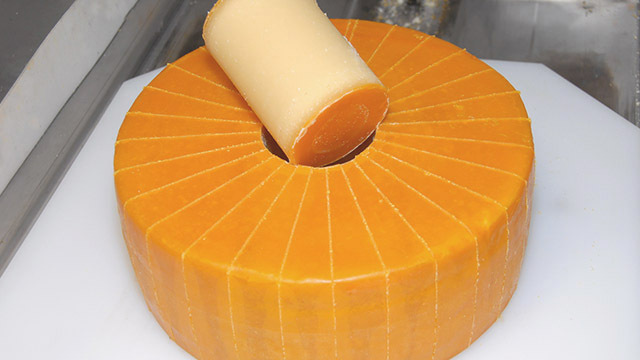 Up to 18 cheese loafs can be placed on a single board. 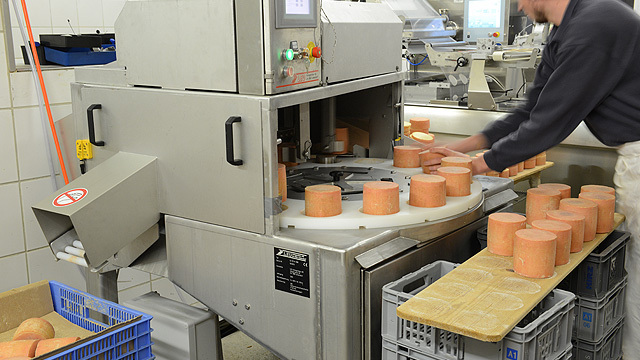 They are directly pushed off the board to go through the different successive curing processes. 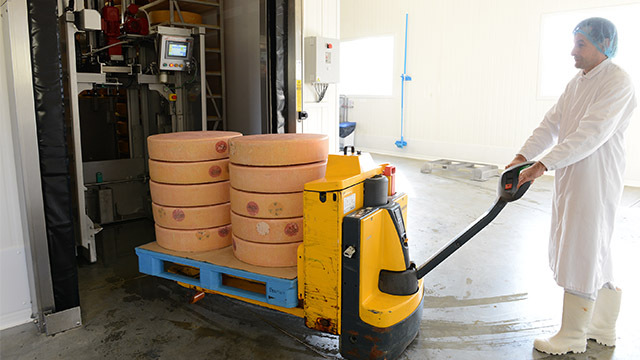 After having been thoroughly cured, the loafs are collected and gently pushed back onto the board. 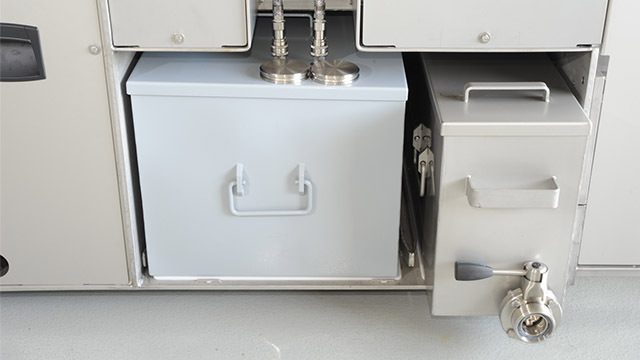 The curing module can be replaced by the traying in/out module. 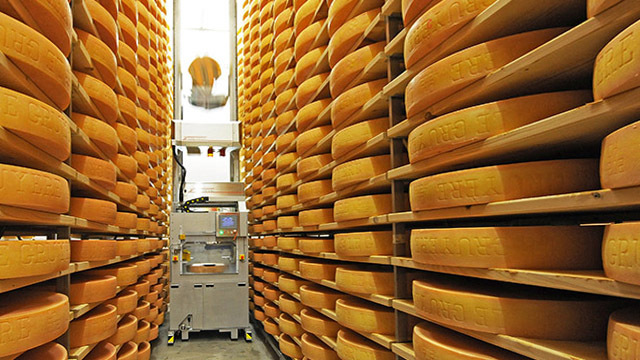 Cheese handling becomes as easy as a child’s play. 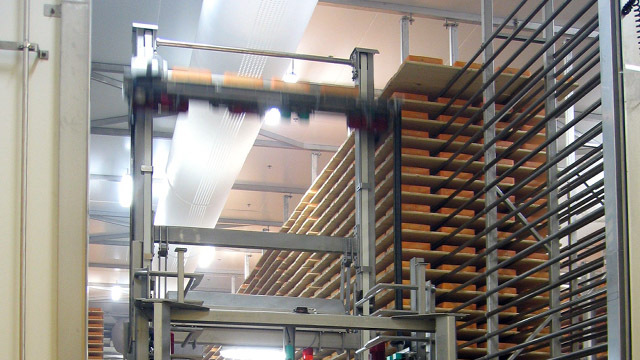 The boards are placed without effort in the right position of the shelf. 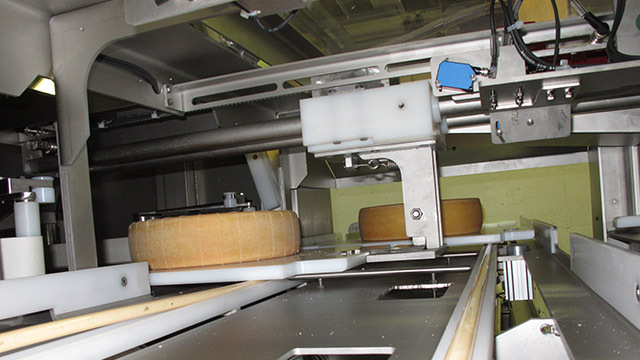 With the board-exchanging module the robot takes over the rotation of the cheese loafs in the shelf during their maturing time. 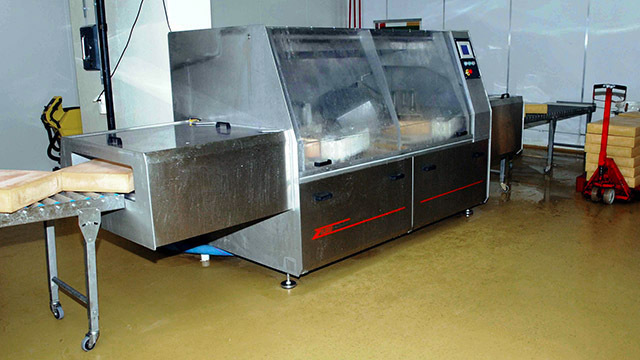 The operator has just to supply clean boards and remove used boards in regular time intervals. 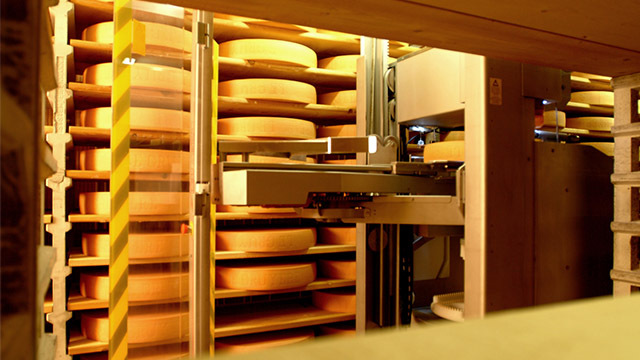 This is the little brother of the LK-40 cheese curing robot. Its compact dimensions and the possibility of selecting the processing speed makes it the ideal machine for small size diaries. Three to four loafs can be placed and simultaneously cured on a single board. 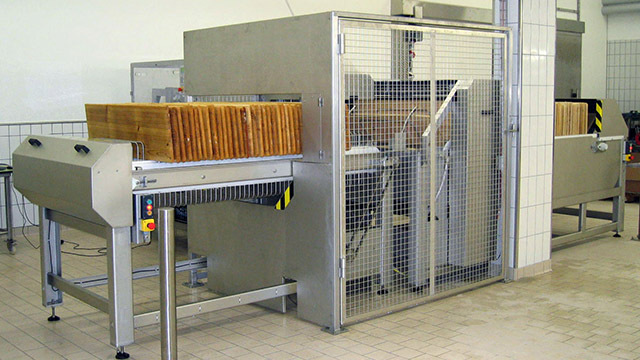 Great importance has been attached to hygiene during the machine design. 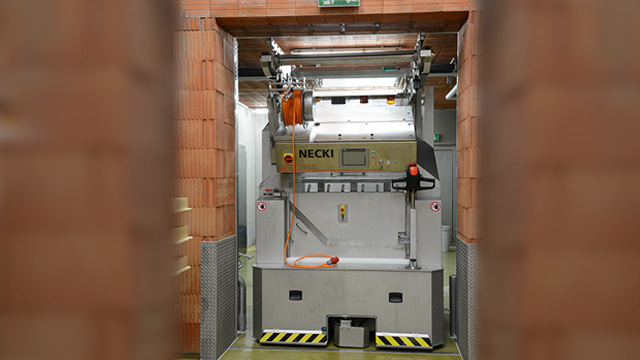 The curing compartment is accessible from both sides which makes handling and cleaning of the machine extremely easy. 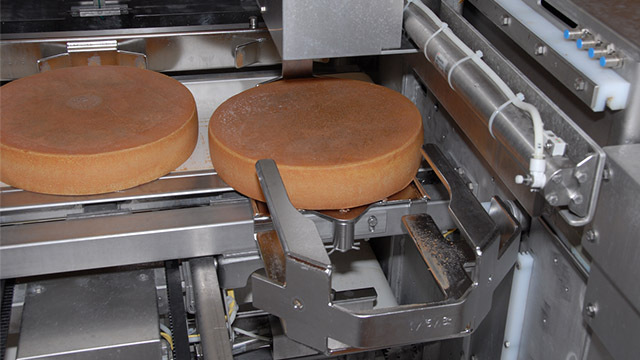 The cheese loafs can be directly trayed in by the robot and placed without great effort exactly at the correct position. 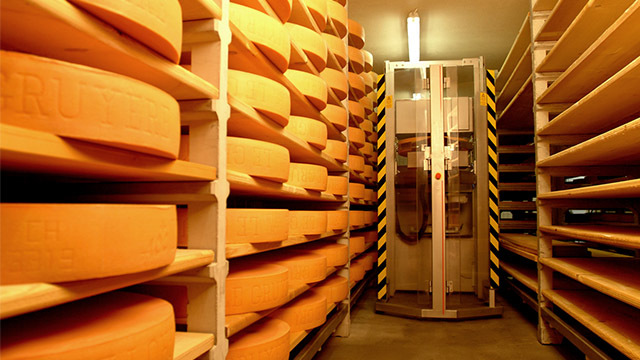 In Appenzeller, Tilsiter, Raclette, Morbier cheese cellars the LK-40-H feels at home. 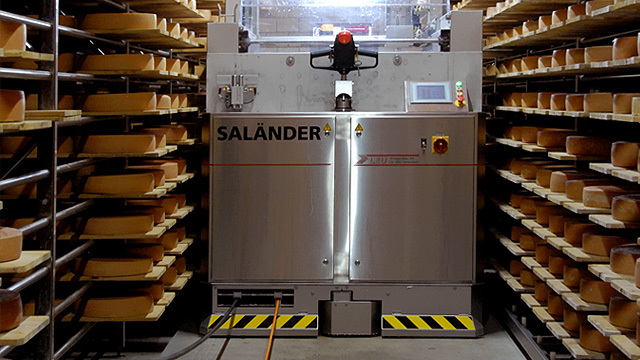 This powerful machine has been developed to cure efficiently sliced and semi-hard cheeses. 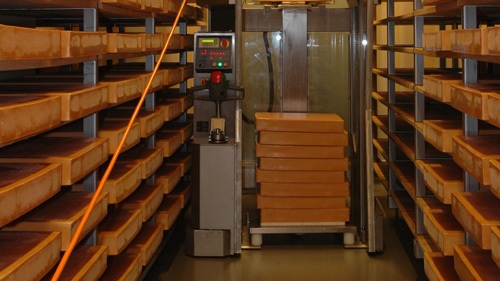 Up to four loafs can be placed on a board and cured simultaneously. 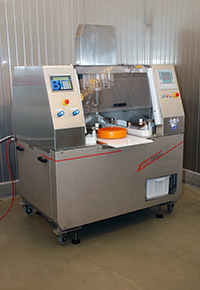 Great importance has been attached to hygiene during the machine design. 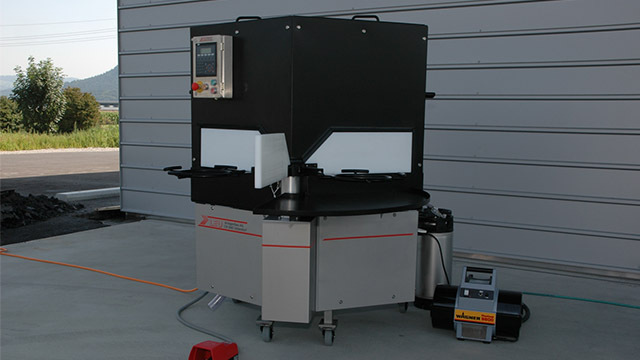 The curing compartment is accessible from both sides which makes handling and cleaning of the machine extremely easy. 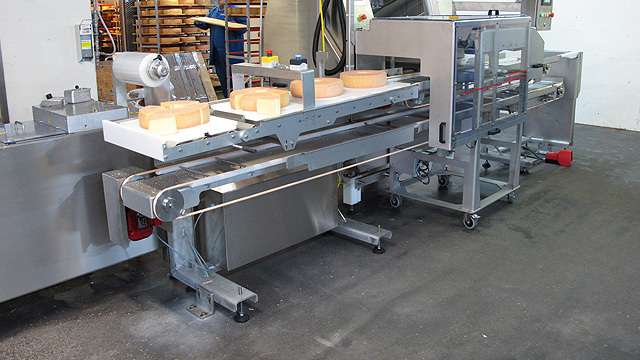 The cheese loafs can be directly trayed in by the robot and placed without great effort exactly at the correct position. 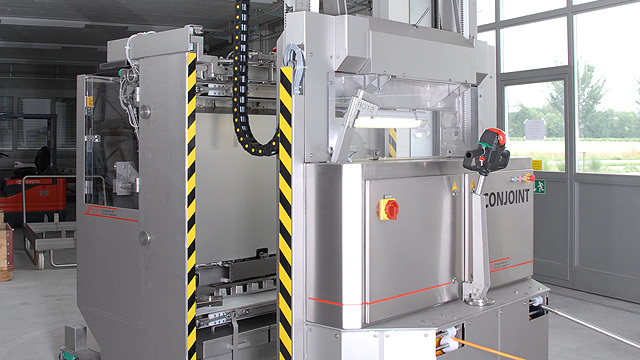 Thanks to the modular technique, curing and traying in/out can be combined with one single machine. 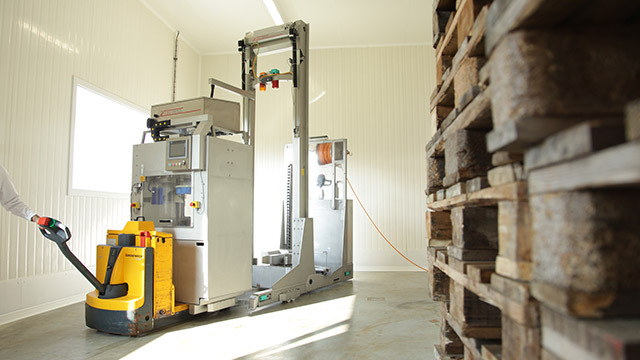 This concept can be extended almost without limit and by using the appropriate module cope with any task such as curing, traying in/out of shelves or from pallets (Euro pallets with two piles), carrying out quality checks, etc. We also develop additional module on customer request which ideally fit into established working processes and boost productivity. 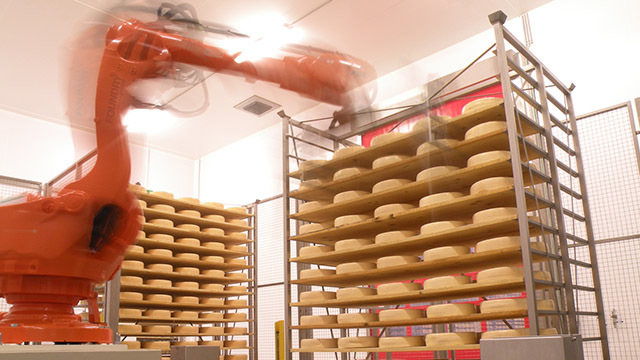 Exceptionally versatile compact and simple robot curing a wide range of cheeses from the Tilsiter to the Emmentaler and from the square Raclette to the Euro bloc cheese. 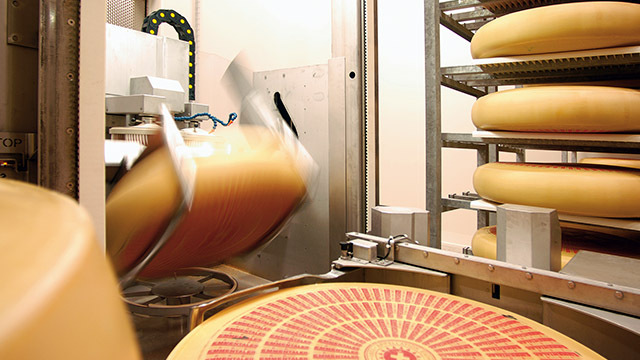 Its clever double gripper can also place and grasp small cheese loafs placed one behind the other to save space. 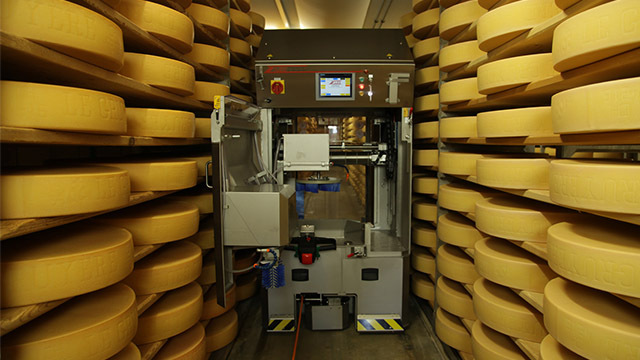 The exceptionally versatile robot was developed to cure Gruyère, Comté and Beaufort cheese. 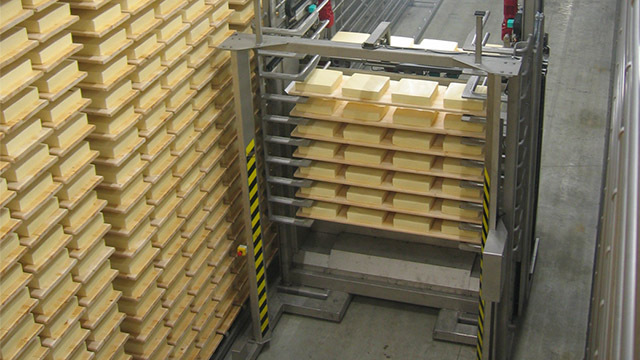 Similar, but also smaller cheese loafs can also be processed without any problem. 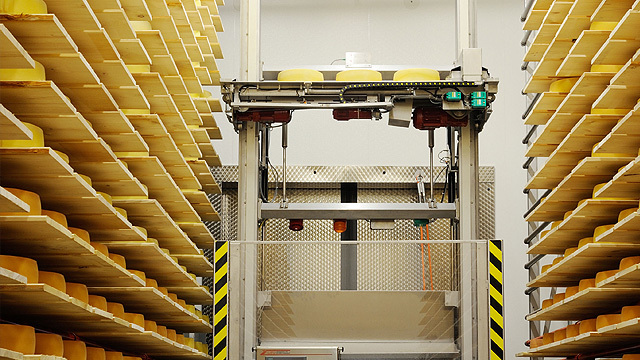 The clever double gripper can place and grasp cheese loafs placed one behind the other to save space. 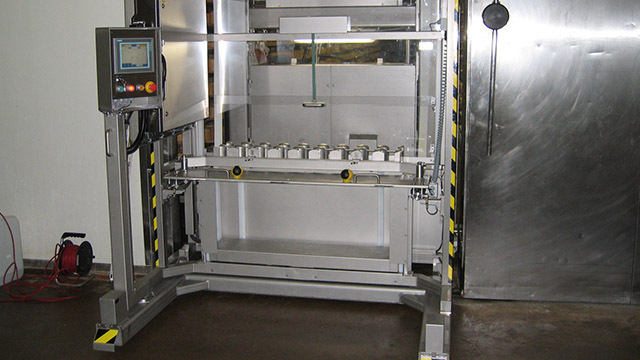 The traying in and out module reduces manual labour to an absolute minimum. 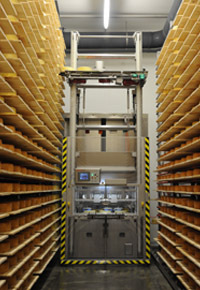 The cheese loafs can be directly picked up from the salt bath rack and trayed in by the robot to optimise the whole process. 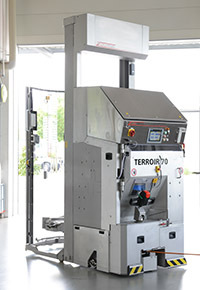 New hygiene and safety requirements were taken into account in the new design of the machine. 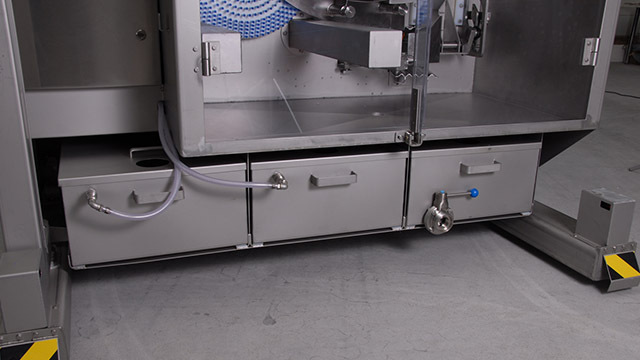 The curing station is accessible from both sides, making it significantly easier to work with and clean the machine.